OnlineMBAreport.com recently spoke with Kathleen Odell, Associate Dean and Associate Professor of Economics at Dominican University about their Online MBA program, including the unique C-Suite Speaker Series, which Online students are encouraged to attend to meet fellow students and hear C-suite execs speak. What type of student typically enrolls in Dominican’s online MBA program? Our online students have the same profile as our on-campus or hybrid format students. They seek personal and professional skills that will set them apart as contributors and leaders solving business problems for their workplace and society. They find a school and program that fits their schedule and wallet, while also delivering a top-tier education in a small class format. They make life-long friendships with their fellow students, contributing to a strong alumni network of thinkers and doers. 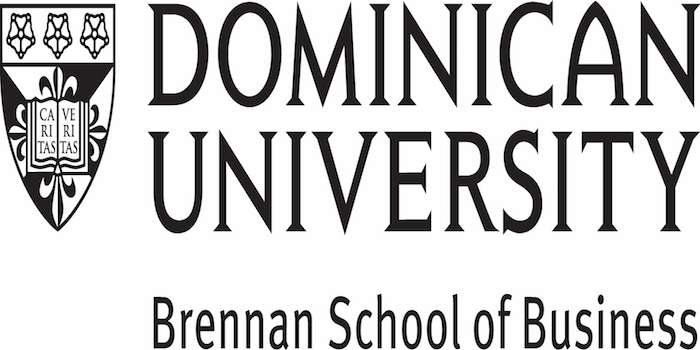 Dominican University offers a range of MBA options, including dual degrees, in MBA & MSW (Master of Social Work), MBA/Juris Doctor, MBA/Master of Library and Information Science, as well as an MBA with a coordinated program in Dietetics. With a wide array of options, how do students chose their program? What is most popular? Most students have a strong sense of the degree that will suit their career goals. For those that are unsure, we offer certificate programs that allow students to try a few courses before committing to a degree or concentration. The most popular degree is the MBA, and the most popular concentrations are Accounting, Healthcare Administration, and Data Analytics. Our more seasoned students often select the new Leadership concentration. Do students at Dominican University work as a cohort or in another way? Two programs follow a cohort (fall) start: MBA-Dietetics, and MSA. The certificate and MBA program are open-enrollment, so students can start any semester and finish at their own pace. How do Dominican University students interact and network with each other and build community? There are events and programs throughout the year to foster a sense of community. For example, all early MBA students take part in a weekend immersion, working with clients as they also observe and develop best practice tactics for teamwork and business case development. This weekend immersion is a required early step in the program for all students, on-campus or on-line. Students also have the opportunity to network with fellow students, university alumni, employers, and business professionals at a variety of events we host throughout the year. As a smaller school, all aspects of the student experience are human-centric. Online students take part in weekly discussion boards with faculty/students and can take advantage of the office hours any time, using their medium of choice. The structure itself, mirrors that of the on-campus or hybrid program, with identical course requirements, elective choices, and course sequences and syllabi. The only difference is the online delivery medium. The difference is intentionally invisible, as the focus is on the outcome: knowledge, skills, and applications to help a student succeed. The business school has its own dedicated Career Development office. Students can elect to work with five Executives in Residence, who have more than 100 years of business experience between them. They will receive counsel and coaching as they explore career options and industry networks, and refine their personal brand including their resume, LinkedIn Profile, and interview skills. Students will gain exposure and visibility to internships and job opportunities when they access the online Handshake portal and attend dedicated career events. The Career Development services are available to students and alumni. Dominican University’s Signature events includes the C-Suite Speaker Series—are online students able to participate in these events? Every year, we host four Signature Events and a variety of more intimate networking opportunities. All of these events are open to our students, and online students are encouraged to attend to build their networks and meet with fellow students, faculty, alumni, and business professionals. Reach to us to learn about the program and support we provide students, throughout the experience, whether online or on-campus. We are focused on your success. Thanks to Kathleen Odell for participating. For more interviews, check out our Online MBA Report Interview Series.